Though we primarily photograph weddings in the DC area, we have also documented several marriages in and around Philadelphia. The City of Brotherly Love has become one of our favorite locations for wedding photography. We sometimes even think of ourselves as Philadelphia wedding photographers! We always look forward to the next opportunity to help a Philly-based couple preserve their wedding-day memories forever. One of the best Philadelphia venues for unique nuptial celebrations is the University of Pennsylvania Museum of Archaeology and Anthropology. That is where the couple in this photo had their marriage ceremony and reception. Housed in its present building since 1899, this Philadelphia institution has existed for more than a century. The purpose of the museum is to preserve historical artifacts that narrate humanity’s development from antiquity to the present day. It is also a great Philly venue for the telling of soon-to-be married couples love stories! The Penn Museum of Archaeology and Anthropology offers some great spaces for every part of a wedding day. Future spouses can say, “I do,” outside in the open air. They can then eat a luxurious dinner in the ornate dining room on the building’s top floor. Finally, they can dance the night away next to sarcophagi and mummies in one of the museum’s best exhibits. 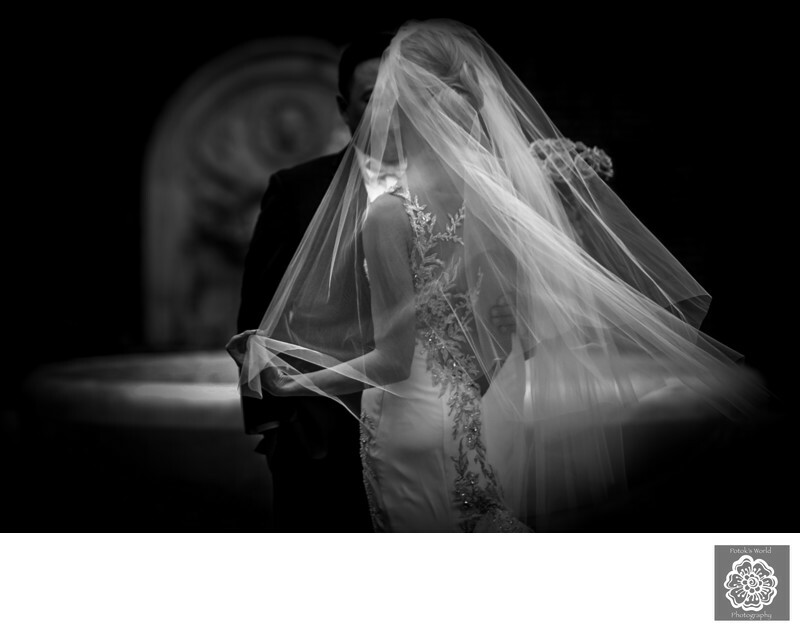 That variety also makes it a dream location for the best Philadelphia wedding photographers. This particular Philadelphia-based bride and groom organized their wedding in the way mentioned above. They had their ceremony outside in the Warden Garden, a green space on one side of the museum’s front lawn. For a Philadelphia wedding photographer, what makes this such a great spot for future spouses to exchange their vows is the brick staircase. That structure leads out from the second floor of the museum to the grass below. This means the wedding party emerges from the museum well above lawn and then walks down the curving staircase. Guests at a Quaker City wedding get an unobstructed view of the groomsmen, groom, bridesmaids and bride during the processional. A Philadelphia wedding photographer can get similarly unobstructed images of the bride walking down the stairs. The pictures can show her moving toward her future husband with the eyes of all the guests fixated on her! After the ceremony, the bride and groom proceeded to the top floor of the museum for a traditional Chinese tea ceremony with their parents. This took place just outside the Chinese Rotunda. During the tea ceremony, Penn Museum's staff prepared that space for dinner by putting elegant place settings on ornate tables. Designed to fit as many as 300 seated guests, the Chinese Rotunda is the largest event space in the building. It is also a sumptuously appointed area that is a great space for a wedding dinner. Following the meal, the entire Philly marriage celebration moved to the Egypt Upper Gallery. It was there that the maid of honor and best man gave their speeches and toasts. That part of the wedding took place alongside carved reliefs, stone coffins containing mummies, beautiful sculptures of Egyptian figures and a statue of the pharaoh Ramesses II. Afterwards, the guests danced and made merry in the surprisingly ample space between the various precious artifacts. It was quite a scene and looked fantastic when captured on film! We captured this image just outside the museum after the Philadelphia-based couple had had their first look. The bride-to-be decided to meet her future husband by the ornate fountain located in the Stoner Courtyard. The latter is located just outside the Penn Museum’s front door. After he saw his soon-to-be wife in her wedding dress for the first time, the groom was overcome with emotion. After he wiped away a few tears, he sat with his bride on the edge of the fountain. The two spent a few minutes just chatting. It was a beautiful scene — just the two of them enjoying each other’s company and the few moments they had to be alone together. We did not want to disturb them by taking a picture, of course. So we moved out of their line of sight and got this beautiful and romantic photo of them.